The blue corduroy jacket worn by members is a widely recognized symbol of the National FFA Organization, formerly Future Farmers of America. In 1933, Dr. J.H. 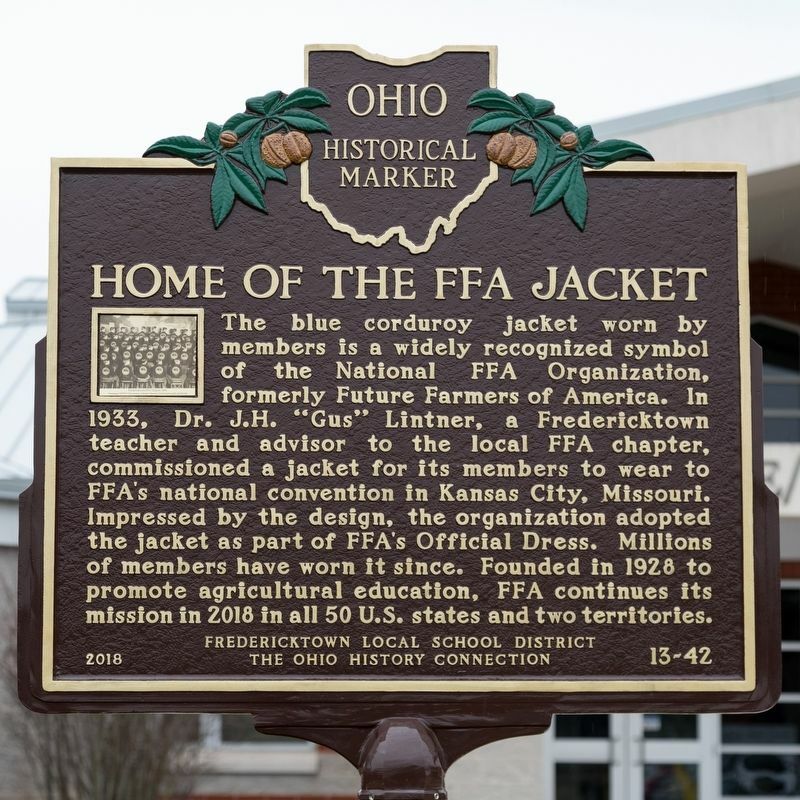 “Gus” Lintner, a Fredericktown teacher and advisor to the local FFA chapter, commissioned a jacket for its members to wear to FFA’s national convention in Kansas City, Missouri. Impressed by the design, the organization adopted the jacket as part of FFA’s Official Dress. 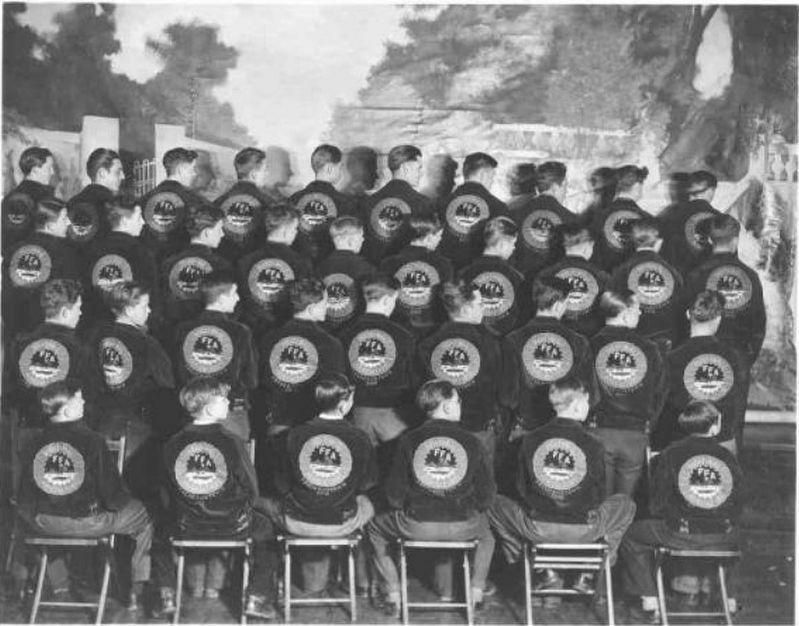 Millions of members have worn it since. Founded in 1928 to promote agricultural education, FFA continues its mission in 2018 in all 50 U.S. states and two territories. right when traveling south. Touch for map. 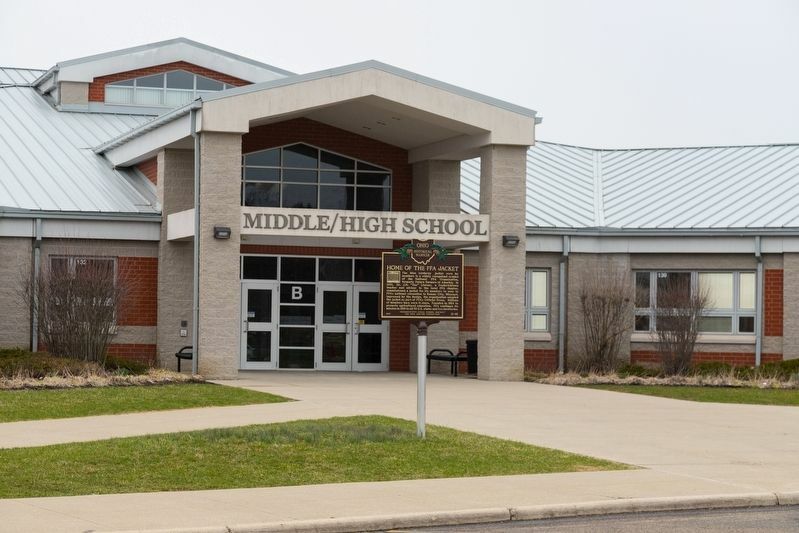 It is at the main entrance to the Fredericktown High School. Marker is at or near this postal address: 111 Stadium Dr, Fredericktown OH 43019, United States of America. Touch for directions. Other nearby markers. At least 8 other markers are within 7 miles of this marker, measured as the crow flies. Webb C. Ball Street Clock (approx. 0.7 miles away); Greenville Treaty Line (approx. 4 miles away); a different marker also named Greenville Treaty Line (approx. 4.2 miles away); Mt. Vernon (approx. 6.2 miles away); Chesterville Veterans Memorial (approx. 6.6 miles away); Vallandigham's Speech, 1863 (approx. 6.7 miles away); Civil War Soldiers Monument (approx. 6.7 miles away); Mary Ann Ball (approx. 6.7 miles away). Touch for a list and map of all markers in Fredericktown. 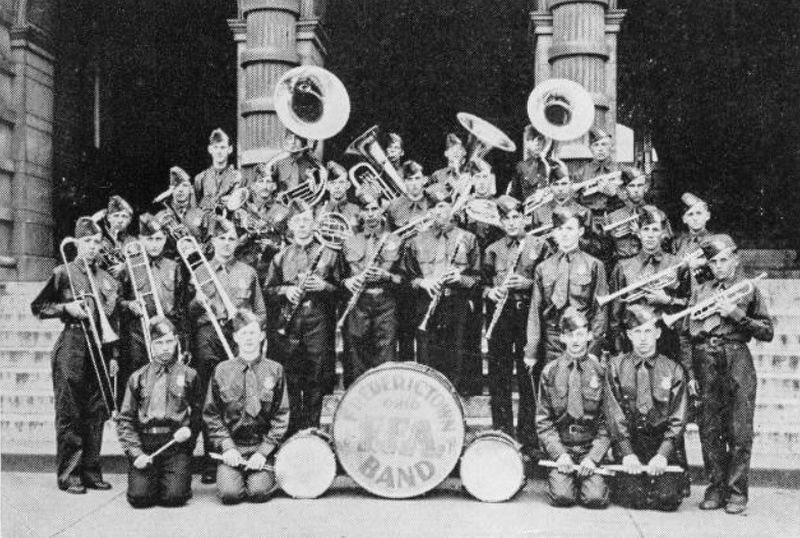 This is the image reproduced on the historical marker. More. Search the internet for Home of the FFA Jacket. Credits. This page was last revised on April 8, 2019. This page originally submitted on April 8, 2019, by J. J. Prats of Powell, Ohio. This page has been viewed 54 times since then. Photos: 1, 2, 3, 4. submitted on April 8, 2019, by J. J. Prats of Powell, Ohio.